“David Bennett, once a brash young commercial diver whose personal philosophy was “cut your way through life to survive,” was caught in a violent storm off the California coast one night where he drowned. While technically “dead,” he met beings of light, relived his life, and peeked into his future, resulting in a complete paradigm shift for him. Later, he discovered he had stage IV lung and bone cancer—so advanced that his spine collapsed. Miraculously, he survived once again, and this second close call taught him even more about living, loving, and how to find purpose in his life. I encourage you to visit VoyageOfPurpose.com and watch the 4 minute video of David as he explains the major events of his life. 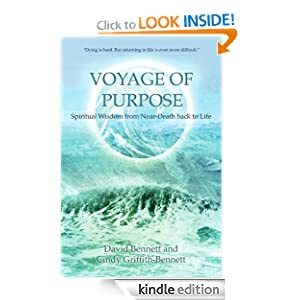 You can also READ EXCERPTS and see all the ways David and his wife, Cindy, are using their lives for the betterment of others.David Bennett is a public speaker, and teacher. David has lectured at the International Conference of IANDS (International Association for Near-Death Studies) and shared his inspirational message at groups across the country including Lillydale.He has consulted for both radio and television including Oprah and Dr. Oz as a NDE resource, appearances including being filmed for NBC national news and PBS. David’s articles appear in numerous magazines, blogs and papers.